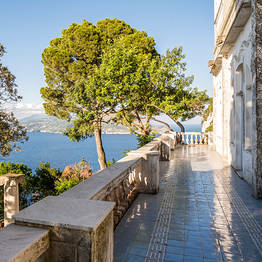 Villa Lysis is a unique and enchanting spot, closely tied to the life and tastes of Jacques d'Adelswärd Fersen, a Parisian count who withdrew to the island of Capri in self-imposed exile to escape a series of scandals in his home country. 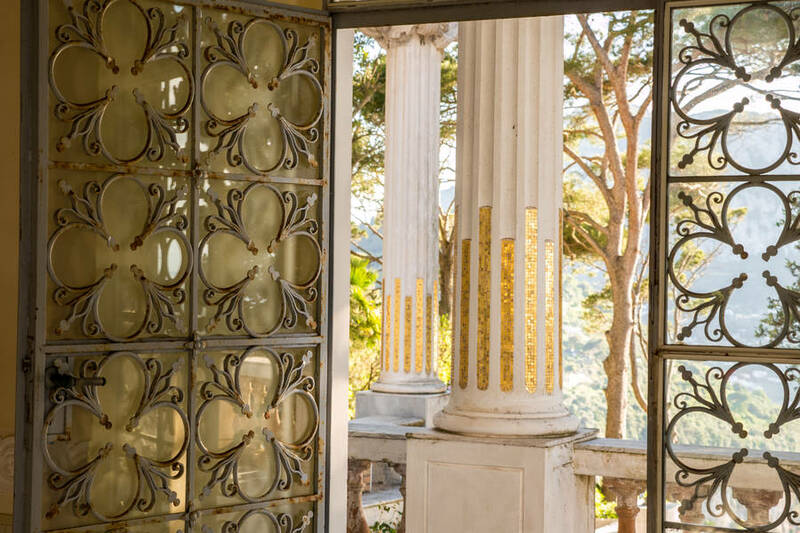 Built in 1904 by Count Fersen, Villa Lysis is as eccentric as the nobleman himself, and his elegant, luxurious home was both reserved and opulent at the same time. 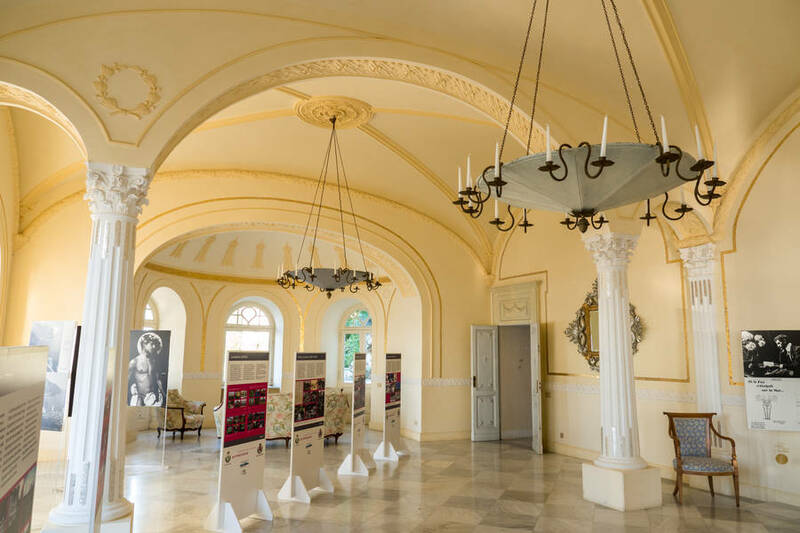 It was here that the count had enough privacy to build a life with his Roman lover, Nino Cesarini, far from the gossip and scandal of Parisian society. 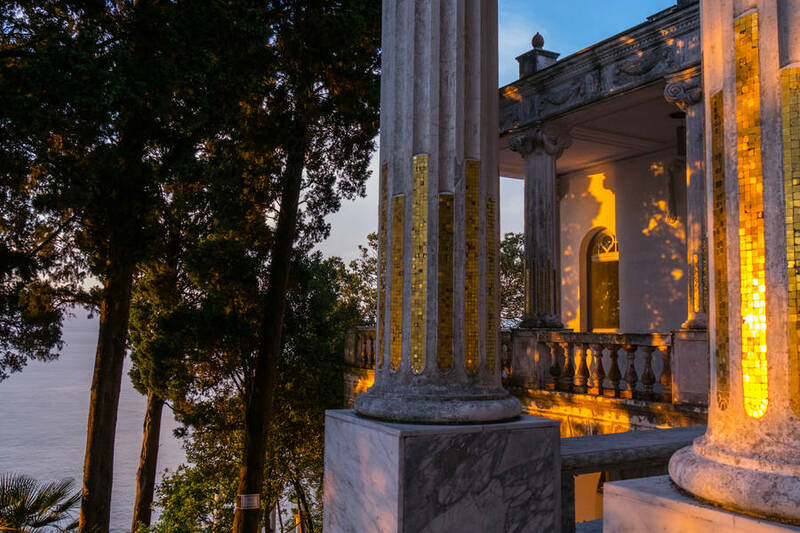 In addition to being Fersen's retreat, Villa Lysis also became a gathering place for artists, intellectuals, poets, and writers who visited Capri during the 1900's drawn to its beauty and leisurely lifestyle. 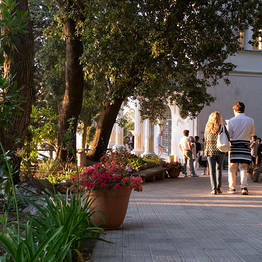 Getting to Villa Lysis: from the Piazzetta, take Via Longano and Via Sopramonte or, alternatively, take Via Le Botteghe, Via Fuorlovado, and Via Croce. Both routes lead you to the "Cross", where you continue on along Via Tiberio to Via Lo Capo. Walking time: from the Piazzetta, it will take about 45 minutes on foot uphill, so be sure to wear comfortable shoes! Villa Lysis leaves visitors speechless with its beautiful interiors, garden, and view. The intimate salons, the grounds, and the Mediterranean stretched out below are all unforgettable, though the blend of architectural styles, furnishings, and precious marble decor from Louis XVI, Neoclassic, Greek, Art Nouveau, and Viennese Secession schools which feature everything from ornate stucco to floral motifs to gold leaf and Oriental influences is what makes this villa truly unique. Be sure to dedicate some time to the garden surrounding Villa Lysis, with its scenic overlooks from the historic villa built on the clifftop over the sea facing the Bay of Marina Grande. 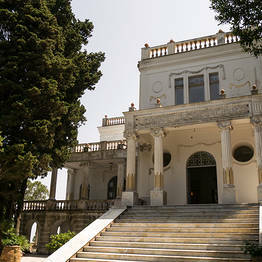 The entrance to Villa Lysis is one of its most iconic features, with a grand staircase leading up to a peristyle lined with Ionic columns and topped by the Latin inscription "Amori et Dolori Sacrum", chosen by Fersen himself to reflect his life marked by the conflict between love and suffering. 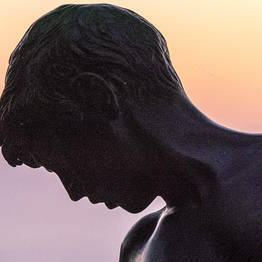 During the summer months, Villa Lysis holds public concerts, art exhibitions, and theatrical and dance performances in addition to elegant private events including weddings, receptions, and gala dinners. For additional information about hosting your event at Villa Lysis, please contact the association that manages the villa directly. Near Villa Lysis on Mount Tiberius, there are two other beautiful sights which are worth a visit and make the walk uphill worth the effort! 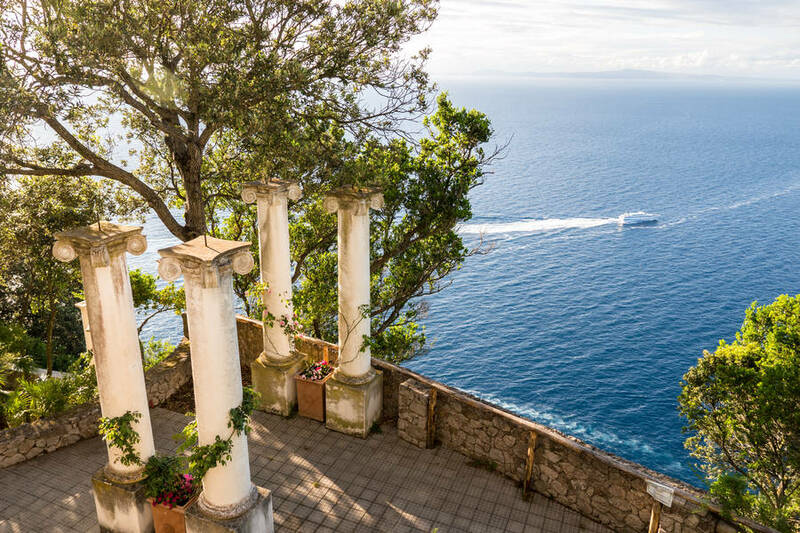 Villa Jovis: the island residence of the Roman emperor Tiberius, this is the most important archaeological site on Capri and is located at the very top of Mount Tiberius. There is a walking trail between Villa Lysis and Villa Jovis. 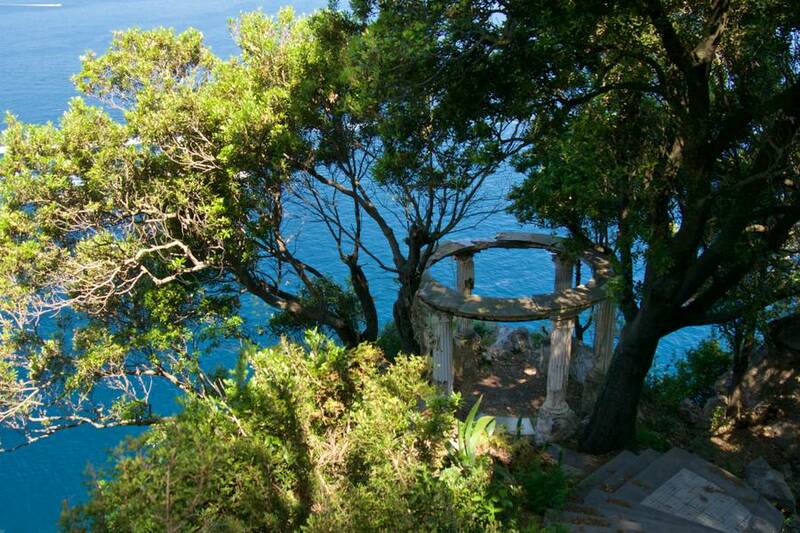 Parco Astarita: this pretty park is located right above the sea and is adjacent to Villa Jovis.